I read an article recently that said, “Gravity is a contributing factor in nearly all accidents involving fallen objects.” Even though, that is a pretty humorous statement, the fact is it takes a lot of over whelming work to overcome gravity. When it comes to rigging “probably” or “maybe” safe, is not the most reassuring words either. Things fall down unless we take preventive steps to prevent them from doing so. Rigging suspended scenery, truss, lighting, curtains and screens depend on top quality hardware, materials and the know-how. Knowing the basic structural properties of any materials used for rigging is critical to understand. Safety, reliable training, inspection, personal responsibility and efficiency are high values we must hold to. The biggest challenge and what will actually be the back bone of rigging is being aware of trustworthy hardware and the working load limits. 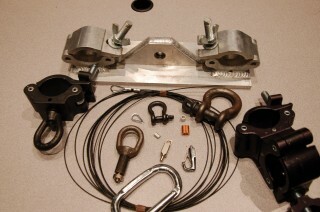 Buy rigging hardware from companies that specialize in rigging is essential. Most of their web sites have a detailed description of the hardware and its load rating. Stay away from buying rigging hardware look-a-likes at a local lumber company. They are not safe for overhead use. Knowing the breaking strength of materials, the weight of scenery flown and the correct construction techniques are just as valuable. If you’re not for sure of the breaking strength, do a controlled test. Using quality wood that have few knots and the correct grain structure is a crucial something to be aware of as well. All wooden frame scenery that will be flown has to be constructed with rigging in mind in order to take the stress and load. The use of wood glue, screws instead of nails and bolts with washers is a good safe practice. It’s the responsibility of the scenic carpenter and scenic designer to use the right materials, fasteners and added attention to make sure it is constructed properly to eliminate any failure. Make it a point before any object is flown check all rigging points, hardware and the weight of scenery matched with the appropriate ratings. Routine inspections of hardware and materials should be done often. Include discussing safety plans with your stage team if something were to fail so your team will know how to respond. For churches that have a line batten systems, having designated trained individuals that knows what to inspection and how to properly use, the line batten system is a must. Scenery changes during a live event can involve moving a ton of weight vertically, in a matter of a few seconds. Some common knowledge among your team should be, know the lifting capacity of your line battens. Never stand under counter weighting or under scenery when hoisting. Call out “clear the rail or area” before loading or hoisting and to wait for a response that it is “clear” from individuals close to those areas. When using secondary rigging such as motorized chain hoists know how much each chain hoist can safely lift and equally important, how much the hoist attachment point can support. Have your hoist inspected and tested periodically. No one should do stage rigging until they have been thoroughly trained. Never risk the life of someone based on probably or maybe safe. If you intend to hang heavy objects over people’s heads, please value doing it correctly. Visit Willowcreekproduction.org, scenicdesigner.blogspot.com or churchproduction.com for video tips on rigging and scenic construction in the weeks to come.